or at your school ? 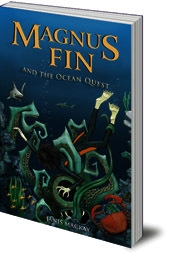 "Inspired by Magnus Fin and the ocean Quest (where Magnus Fin meets a terrible monster under the sea) I will be encouraging people to create their very own sea creature and weaving a story around his – her – or IT! " Come along and listen to author Janis Mackay read from her award winning novels – then create a character and write a story of your own. Suitable for age 7 plus.